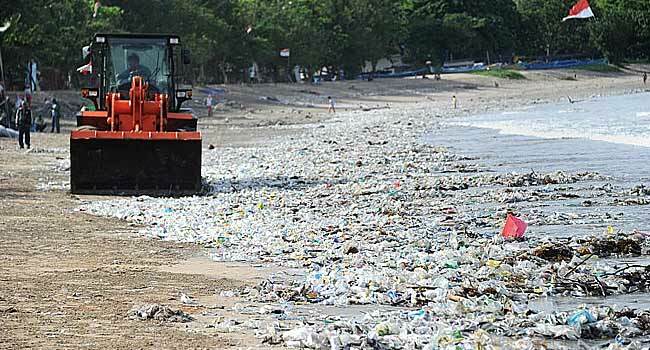 Photo taken on December 19, 2017 shows rubbish collectors using heavy equipment to clear plastic trash on Kuta beach near Denpasar, on Indonesia’s tourist island of Bali. Millions of tourists are drawn to Bali’s palm-fringed scenery and rich marine life, but a British diver has released stark footage highlighting a growing problem in its famously crystal-clear waters: plastic rubbish. Millions of tourists are drawn to Bali’s palm-fringed scenery and rich marine life, but there is a danger lurking beneath its famously crystal-clear waters: a wasteland of plastic rubbish. Indonesia, an archipelago of more than 17,000 islands, is the world’s second-biggest contributor to marine debris after China, and a colossal 1.29 million metric tons is estimated to be produced annually by the Southeast Asian nation.